Browse: Home / 2017 / December / 01 / Part 6 The Llewellyn frame casting story. 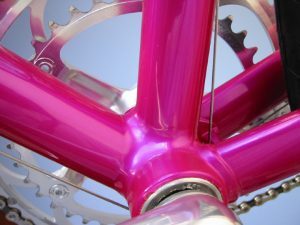 2001, I want to make steel frames. Every one tells me I am mad, steel is over. It is aluminium now. Aluminium is a terrible material for a bike frame for many reasons but…………………… I start the process, TIG welding courses and pondering the tool up process. I look at a PC for the first time. How does one work this thing ? Internet, digital cameras, typing, websites, forums , marketing, CAD programs, that was the evening hours after 10-12 hours standing at the bench, while the Australian Broad Casting gave me Radio National or the test cricket. There is a lot more to deal with in the frame making caper compared to the 1980’s and this means a lot more time is consumed that is not bench time making stuff that results in writting the invoice. It was then that my neck discs started to make themselves felt and my arches in my feet started that slide to errrr yukkkk. My grand-father said it was better to wear out rather than rust out but I did not expect to wear out so early. He lived to age 95. 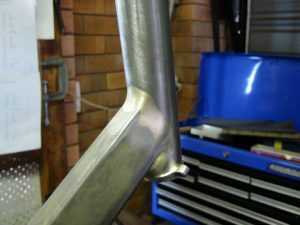 There was no choice but to go down the path of fillet brazing funky shaped tubes from Dedacciai and Columbus. 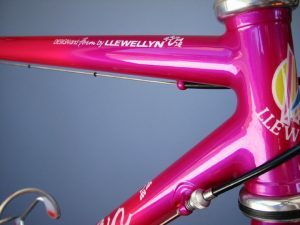 I had done a bit of fillet brazing in the 90s but it was 95% lugged frames back then. 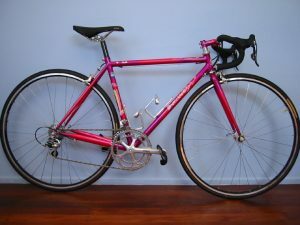 Sloping top tubes was the norm now and I did the occasional lugged frame. I got a fair bit of inspiration from Casarti frames in Italy for my lugless work. A couple of times I cast my eyes over their products during visits to the Milan Bike show. I was driven to persevere at the long hours of toil, mostly 7 days a week by the fear of failure. Every dollar was precious (that has not changed) If I failed it was because there was no more I could give. Most important that all of this was possible because I do not have any children. As long as I could eat and pay the mortgage I was OK. I tell this to many budding newbies. Then I had a bike test published in Ride Magazine in 2001 and that caused the phone to not stop ringing. YAY! Phew! By early 2002 I was confident I was still staying on the frame making stage and I could pay the mortgage if I lived cheap. I still did some moonlighting trips with the cycling teams here and there, a couple of Commonwealth Games and trips to New Zealand, France, Italy. That all helped the income stream and was an interesting break from the work bench toil. The era of the Carbon infestation is getting closer. Tick tick tick tick………………….. It was time to have a go at designing and producing my own invest cast frame parts, but how do I do this ?